One night, while walking in the little lanes behind the Opera in Madrid I came across the workshop which you can see above. It is exactly the kind of shop that you might want to find near an opera. The next morning I walked into the shop, and into a world I did not know of. Mariano Conde and his son run this workshop. I learnt about the subtle difference between a classical and a flamenco guitar. The flamenco guitar is louder, so it has a thin top, usually made of spruce. This is lightly attached to a hardwood back and sides, often cypress. The classical guitar, on the other hand, often has rosewood on the back and sides. The workshop specializes in using different kinds to wood to modify the sound of a particular instrument. For the uninitiated, like me, it sounded like the makers of magic wands, Olivanders, from Harry Potter. More resemblances arose. The father-and-son also make something called a poem guitar (guitarras del poema). This is a guitar with a poem written into the inside, a collector’s item. I might have heard of a guitar with a dragon’s heart string next. I looked at the prices, heroically suppressed a shudder and walked out again. We had not planned to do any bird-watching while we were in Spain. The Family had not even carried her binoculars with her. When I saw a few sparrows raiding the ground around a cafe in Madrid for crumbs, I took photos because I was not doing anything else. Imagine my surprise when I looked at the photos and found that they did not resemble any sparrow I have seen before. Thumbing through my field guides I came to the conclusion that the species is not found in India. Further search makes me think I might have seen immature Iberian rock sparrows (Petronia petronia). An adult would show a distinct yellow patch at the throat, and a more well-defined light streak above its eyes. Notice the thick yellow beak and the long grasping toes; these are characteristic of both the adult and the juvenile. 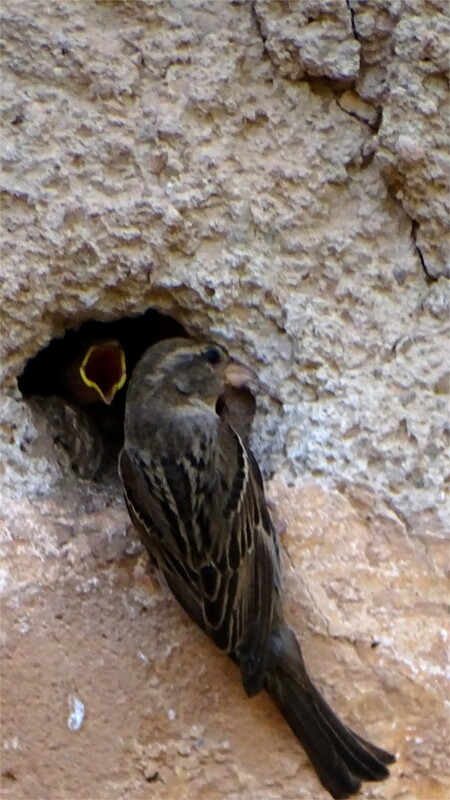 This surprise made me go back to a photo I had taken in the Alhambra of a sparrow nesting in a hole in a wall. It wasn’t the same. In fact this was another sparrow which I had not seen before, and which cannot be found in and around India. Another search led me to think that this is the so-called Spanish sparrow (Passer hispaniolensis). The streaks on the back and the markings around the eye distinguish it from the house sparrow. By the markings that I see, this individual is a female. I took this photo originally because of that immense gape of the nestling. Two lifers! Even without looking for them. Sometimes one gets lucky. I’ve seen three kinds of sparrows in India: the common house sparrow, the Eurasian tree sparrow, and the russet sparrow. This almost doubles the count. I would have to travel across central Asia and Africa to see the remainder of the dozen or so old-world sparrows. It had rained the previous night, and the temperature had turned bearable just as my trip to Spain was coming to an end. Around mid-day I walked down Gran Via, a street full of shops, movie halls, theatres, bars and restaurants, and even one casino. Construction of this road started in 1910, following 40 years of planning and dithering. In these 40 years musicals and satires were written about it, and the name Gran Via was originlly given to it as a joke. In the 19 years that passed before it was completed, 14 other streets were destroyed along with buildings around them in order to construct this showcase of urban planning. I started my walk from the Plaza de España, near the end of the street. Brick facades just off the Gran Via drew my attention. The style was popular in the 1920s and 1930s, but the use of brick and tiles in decorating the facade makes them look very attractive even now. The buildings on the main avenue are in a mixture of styles, as you can see from the photos below. Particularly notable for its chequered history is the Edifico Telefonica, which played a role in the defence of Madrid during the civil war, and therefore had the distinction of being the most frequently shelled building of that time. Ernest Hemingway was one of the war correspondents who covered the news from his haunt in the bar at Museo Chicotle next to this building. Perhaps he gave the name "Howitzer Alley" to this road at that time. Unfortunately, it is hard to find a detailed list (in English) of buildings along this route, or their architectural history. But if you are willing to try to puzzle out the Spanish, then there is an excellent guide which you can find here. While walking from Madrid’s Atocha station to Plaza Mayor, we came to an interesting sculpture in a small plaza. A look at my phone told me that the triangular space was called the Anton Martin Square. Public sculptures in Mumbai are all polished stone and bronze, so the relatively new medium of oxidized iron catches my eyes. The attitudes of the figures seemed to suggest either resistance or a resolve to work together, like in a team huddle in the middle of a match. We crossed the road and walked up to the pedestal. A plaque was installed there. As I puzzled out the Spanish, I got a lesson in recent Spanish history. On January 24, 1977, in an office of labour lawyers located at number 55 on this Calle Atocha, four lawyers and one trade unionist were murdered, and four more lawyers were injured. All were members of the PCE [Spanish Communist Party] and CCOO [Worker’s Commission]. This sculpture reproduces the painting of Juan Genoves called The Embrace, a symbol of the restoration of freedom. It was inaugurated by the Madrid City Council on June 10, 2003, as a tribute to those who died in that violence. It is an homage to those who died for freedom in Spain. On January 24, 2007, on the occasion of the 30th anniversary of this sad event, this explanatory plaque is installed, for the knowledge of the people of Madrid and of those who visit us. The plaque told us the bare facts of the assassination of lawyers working for a labour union in the years immediately after the death of the dictator Franco. My notion that there was a quick and peaceful transition from dictatorship to democracy in 1975 turned out to be mistaken. Perhaps it was quick and relatively bloodless compared to the reverse transition in the 1930s, which is remembered in many works of art, including Picasso’s Guernica. But for people who lived through the 1970s, it must have been chaotic. After we walked to Plaza Mayor I googled the Atocha atrocity and found the story in a small article in Wikipedia. Remnants of Franco’s parties, allegedly aided by an Italian neo-fascist party and perhaps the remnants of a secret anti-communist cell inside NATO, rounded up labour lawyers, lined them up against a wall here, and shot them. Four survived. The resulting public revulsion led to a legalization of the communist party, and informed the liberal new Spanish constitution. We found flowers tucked into the monument (see the featured photo). The Family asked me to find out why. As I searched, I found that Spain celebrates the constitution of the new decentralized state on June 8 and 9. This was two days before we chanced on this sculpture. The drying flowers are testimony to the fact that the events commemorated in this square are considered to be a part of history of the constitution. 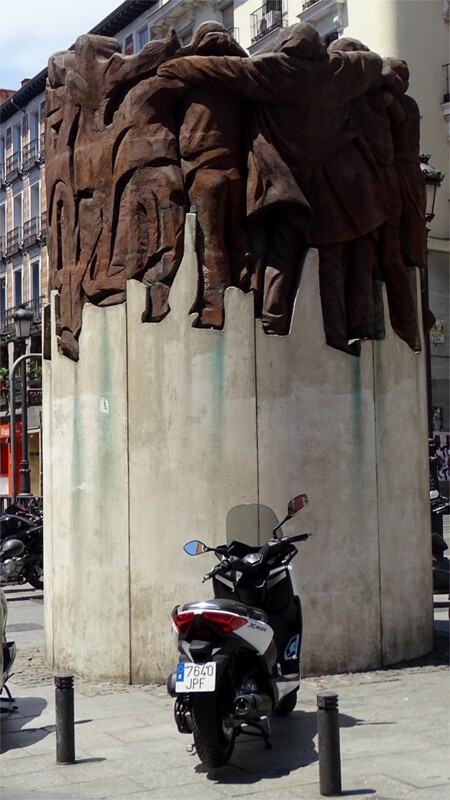 In the daily life of people, the monument provides a little island where you can park a scooter. This reminded me of a saying attributed to Mulla Nasiruddin, "A book may be used as a pillow". Prado is a blank in my camera. With its ban on photography, one of the world’s greatest museums of European art is that enigmatic. The Museo del Prado was the first stop in our visit to Spain, and the five hours we spent there was barely sufficient to get an overview of their collection of Spanish art. If the Mona Lisa is the most visited painting in the Louvre, Las Meninas by Velazquez (below) is the single most visited painting in the Prado. I was with the majority. When The Family picked up a floor plan, I looked for the quickest route to Las Meninas. The huge painting dominates the gallery it is in, and has an enormous crowd which moves around it. The audio guide at the Prado is very informative, and a large number of people here were using it. One interesting fact, not mentioned by the guide, but visible in the statue of Velazquez outside the Prado (featured photo), is that Velazquez used special long-handled brushes for such large paintings. This made it possible for him to gauge the effect the painting would have for a viewer standing at a distance. Another wonderful painting by Velazquez in the Prado is The Fable of Arachne, perhaps one of his last paintings. The Prado holds the Royal Collection of Spain. Although this is the nucleus, much has been added over the years. The original building, designed by Juan de Villanueva, has long been insufficient. New wings and galleries were added over the years, three independent buildings now hold gallery space for the Prado, and new space is currently being added. A day or two is not enough to see it all. It is best to buy a ticket on-line fairly far in advance. You are given a 15 minute slot for entry, but you can use the ticket for the full day, and even leave and come back in the same day. The cafeteria is very good and you do not need to leave if you don’t want to. We had a quick lunch in the museum’s cafeteria after taking in the extensive collection of paintings by Goya. The paintings on display change, some come out of the holdings on to the walls, others circulate around the world. There is a limit to how much art you can absorb in a day. The Prado is immense, and one needs to visit it several times in order to take in all that it has. Plaza Mayor today is a fun place: a large enclosed pedestrian square lined with cafes, restaurants and shops. We strolled through the surrounding arcades, window shopping, before we decided to eat at one of the restaurants around the plaza. The plaza was alive with people in the warm summer evening, as you can see in the video below. There was nothing to remind us of the public executions, beatifications, bullfights, or the burning of heretics by the Inquisition. If you read the history of the plaza, you see an emperor’s desire to remake the city into a grand capital by removing what must have been a congested marketplace at the crossing of the roads to Atocha and Toledo. Juan de Herrera drew up the plans under Philip II but construction started only in 1617, during the reign of his son. This is why the equestrian statue of Philip III stands in the middle of the square, as it has, intermittently, over the last couple of centuries. The present look of the square dates from after the fires of 1790s, and is due to the appropriately named Juan de Villanueva. I did not take photos of the frescoes made in 1992 on the northern facade to celebrate Madrid’s year as Eucrope’s cultural capital. 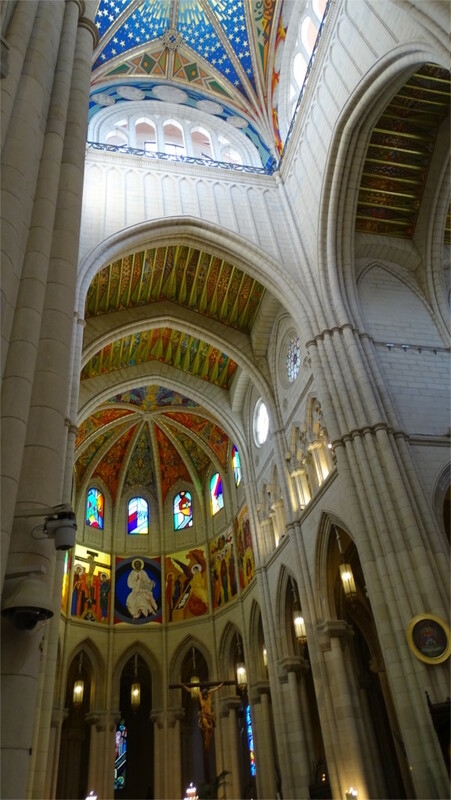 As we walked past this church in Madrid, I would not have guessed that it was only a hundred years old. The building was huge, and the entrance to the church was squeezed between two parts of a facade lined with windows. The Family said, this looks like a residential church. Indeed it was, as we discovered from prophet Google. The parish church of Santa Teresa y San Jose, to give it its local name, is a combination of a hospital, a religious convent and a church. Work on it was started in 1916 and completed in twelve years. 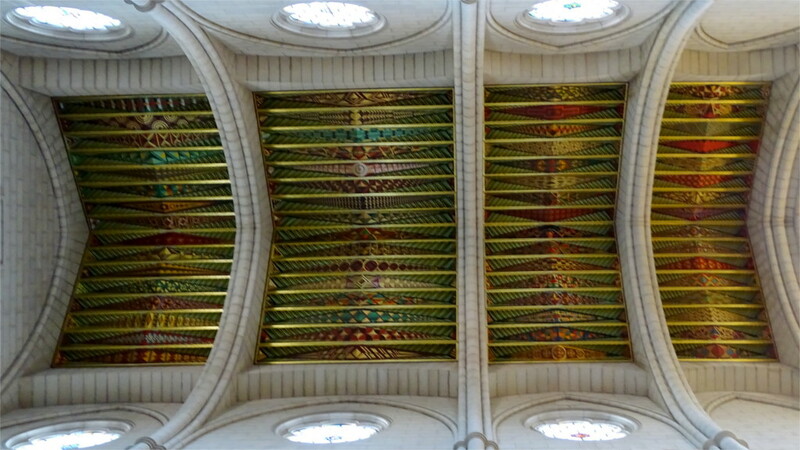 Within a few years, it was burnt down during the Spanish Civil War, and was then reconstructed. So, the crenellation and Gothic look of the structure is just href=”https://wordofthedaychallenge.wordpress.com/2018/08/14/redolent/”>romantic imagination. We saw that a religious service was in progress and did not go in. 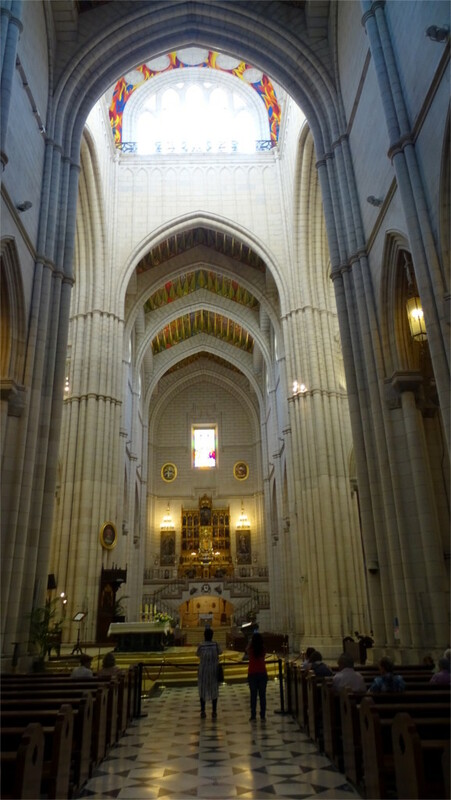 In Spain tourists are often forbidden from entering churches during service. 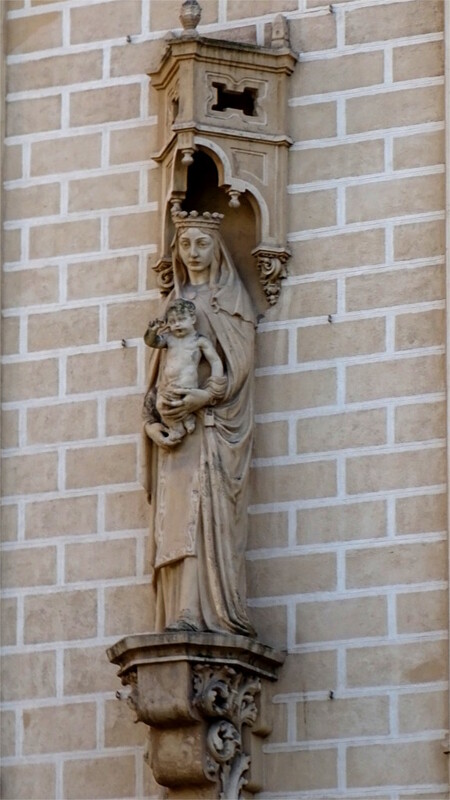 There were statues and other decorations on the facade (I think the photo on the left probably shows the patron saint of the church), all striving to make the church look older than it actually is. 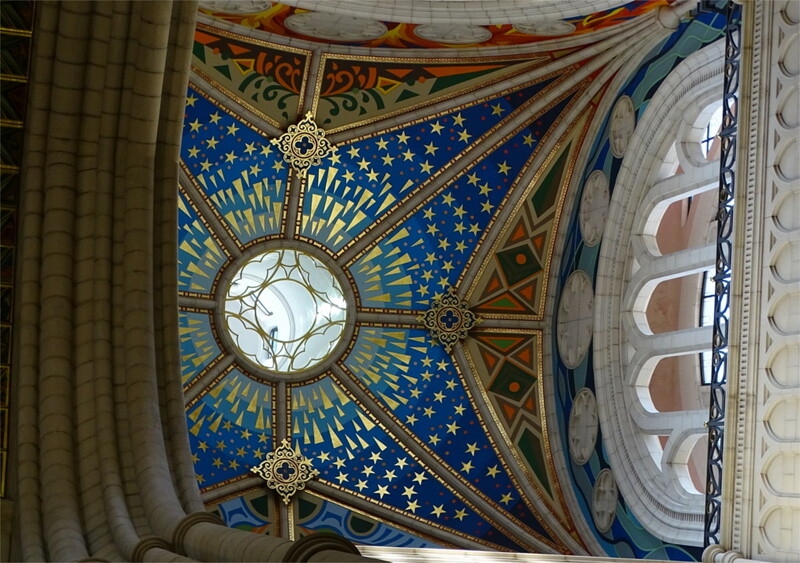 We gawked at all this and decided that the most admirable part of the building was the mosaic covered full dome which you can see in the featured photo.